Superb quality integrated Laundry bin, with soft-close runners, from Hailo is designed to hide away laundry in your kitchen or utility room. 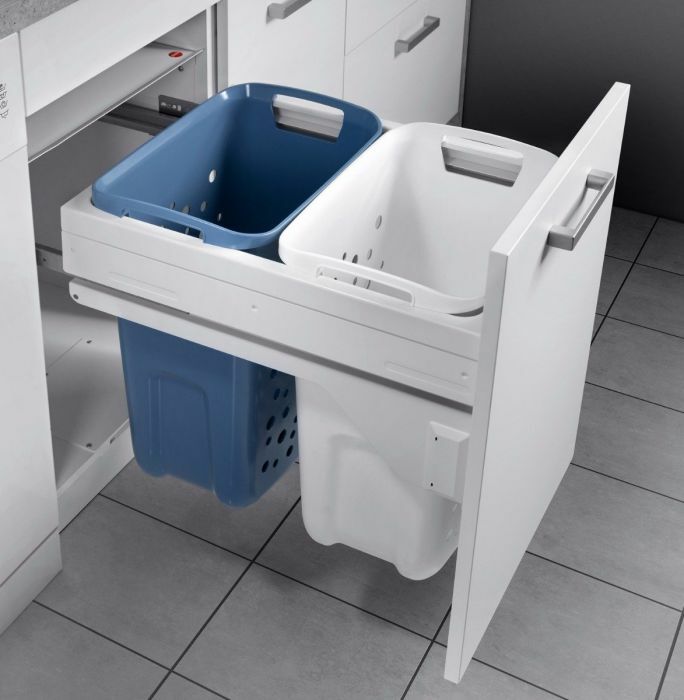 Suitable for cabinets with 500mm wide pull-out doors the unit has two 33L baskets, one white and one blue to help sort your whites and coloured washing which is enough for two average loads. (Note that this bin needs to be installed in a cabinet with a minimum depth of 530mm). The baskets hold enough for two average loads and the large handles on the baskets make it easy to carry the washing. The tough white coating will stay looking fresh and clean and the strong runners will carry up to 70KG. Smooth, easy opening and soft-closing of the cabinet door is provided by Grass Nova pro soft close runners, included in the price. Internal cabinet width: 462-468mm (with side panels 16-19mm thick). Buckets in blue and white heavy duty plastic.